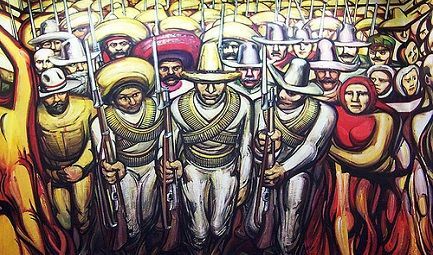 November 20 is Mexican "Revolution Day" or Mexican "Civil War Day" which is the equivalent of America's 4th of July. Obama's choice of this date for his departure from his Oath of Office and the US Constitution creates a permanent symbolic relationship between his actions and Mexico's violent revolutionary and civil wars from 1910-1920! "Obama is making a powerful and dangerous symbolic declaration to large Spanish media audiences today comparing his new immigration orders to the violent Mexican revolution and civil war!" said William Gheen, President of ALIPAC. "Obama is timing his move to thwart the American public's voice in Congress to coincide with Mexican Revolution Day and the Ferguson verdict while CBS, ABC, and NBC will keep most US citizens oblivious tonight!" The world's largest Spanish language media corporation Univision plans to interrupt one of their most popular shows to carry Obama's Mexican Revolution Day message to hundreds of millions of Spanish speakers in the USA, Central and South America, and around the globe, while only a narrow band of Americans will see Obama's speech live on TV. While millions of current and future illegal immigrants watch the speech, only Americans watching Fox News, CNN, CSPAN, PBS, and MSNBC will know anything is happening. ALIPAC and Overpasses for America are launching a coalition emergency plan to increase American English speaking audience viewership of the Obama speech tonight at 8pm ET Nov. 20, 2014. Concerned American citizens are being asked to warn as many other Americans as possible about tonight's nation destabilizing decree from Obama using text messages, phone calls, emails, tweets, Facebook posts and shares, online forums, talk radio shows, and other social media. Finally, the coalition has built a Facebook Event page similar to the ones used to organize more than 600 protests against Obama and illegal immigration between July and October of this year to organize activist behind Operation #StopO & Backlash Reaction! American citizens who watch Obama's speech are asked to self broadcast their reactions immediately following the speech using social media, phones, emails, and website posts. "We do not need the pro amnesty Fox News and CNN networks to carry our reaction to Obama's speech!" said James Neighbors, founder of Overpasses for America. "We need a large number of American citizen activists to share Obama's speech and their reactions to it hand to hand online to as many people as they can for as long as they can! We plan to get the word out tonight using hand to hand activism!" Gheen and Neighbors hope other leaders and organizations will join this coalition effort quickly and take up the challenge to join the "Backlash Reaction" marathon internet activism effort! Leading activists plan to communicate their reaction to the speech using all electronic means necessary including a Twitter Bomb at #StopO.